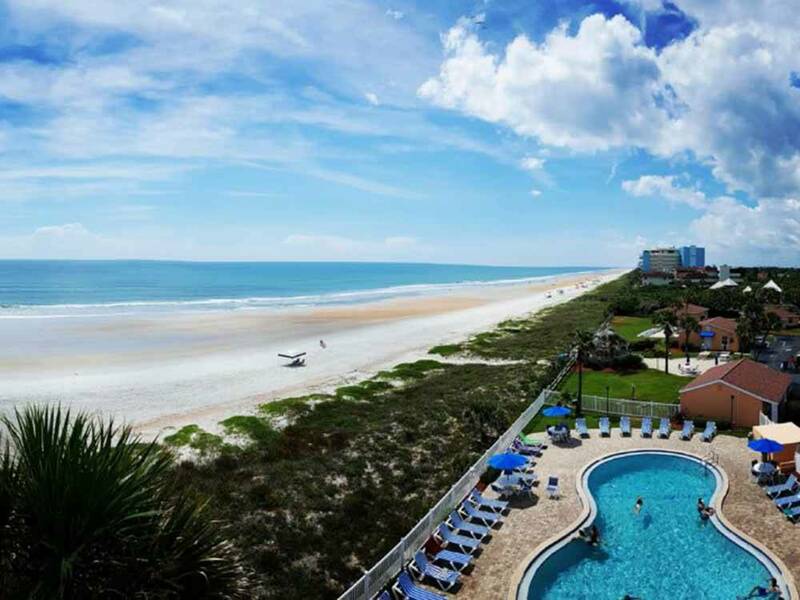 Located on the Atlantic Ocean, central to Daytona Beach, St Augustine & St John's River. 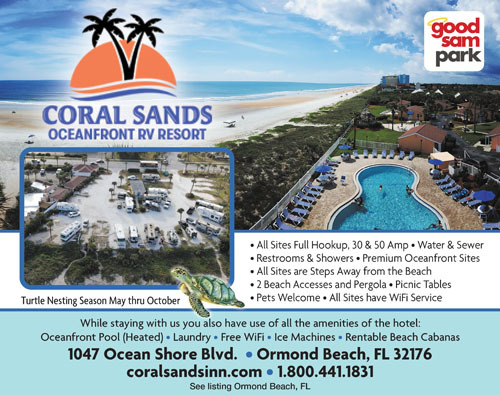 Sister facility to Coral Sands Hotel including all amenities, perfect for family reunions and other occasions or relaxing on the beach. Can't get much closer to the beach than this campground. It is called a resort but I would not consider this campground a resort. You are allowed use of amenities at the overall resort such as pool. Sites are close together and big rigs with slide outs make it even tighter. Water, sewer and electric were good. We stayed at Site 34 which is right next to the road and there was lots of road noise. Pick sites closer to the ocean to get away from road noise. The resort is pet friendly but the dogs are NOT allowed on the beach. You have to travel to Flagler(about 15 minute drive) to walk your dog on the beach. Restroom needed some TLC and paint. Women's restroom was out of order part of the time we were there. The site was very pricey at $80/night plus taxes. But it was January and everything in Florida is pretty well booked. We did not have reservation and stayed 7 nights. Plenty of restaurants and Publix close by. We felt pretty safe there and did not see any security concerns with leaving stuff out. Overall, if you want easy beach access and don't mind paying for it, then this is a good spot. We just got home from our stay there and loved it! It's a nice cozy small park with restrooms and showers right there and you also have access to their hotels pool and other amenities. It's right on the beach and are already planning on going back! We were traveling back home to Florida from South Carolina and were looking for a place to stay on the ocean. Coral Sands fit the bill. All of the staff was pleasant and helpful. They encourage you to park and get comfortable then check in with them. The park is literally steps from the Atlantic Ocean. The park is small but easy to enter and exit and all of the sites are good size. We live and travel in our 40' DutchStar, we had no issues backing into our site. There are two pull-thrus, the other sites are in a horseshoe formation with a few smaller sites in the center. The park is clean. You can have a campfire on your site as long as you have a screen cover. Free Wi-Fi. The bath house is large and very clean. The pool is beautiful and overlooks the Ocean. The laundry room is clean. All of the amenities of the Inn are available to the RV park. Grocery store about 1/2 mile from the park. Coral Sands is one of our favorite parks so far.